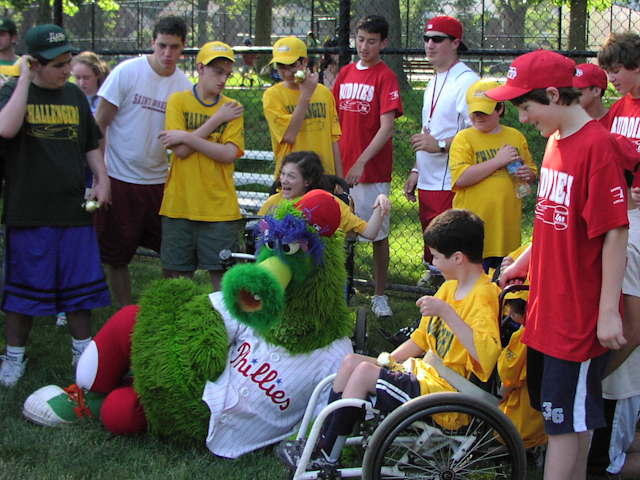 The Challenger Division was established in 1989 as a separate division of Little League to enable individuals with intellectual and developmental challenges to enjoy the game of baseball along with the millions of others who participate in this sport worldwide. Today, more than 30,000 people participate in more than 900 Challenger Divisions worldwide. Challenger is held in the Spring at South Ardmore Park, Sundays, from approximately 3:00pm to 5:45pm. We divide our Challenger teams and consecutive games by age, with players 4-14 years of age playing in the Minors league, and players 15 years of age and older (now with no upwards age limit!) playing in the Majors league. A game will run for approximately one hour with practice and simple 'skills training' preceding. A large plastic whiffle ball and plastic bat is used. Some players elect to use a glove although it‘s not necessary. No score is maintained, all players on each team get to bat and advance the bases. All players bat without “outs” and after each player is up and moves through the bases, the players all “come home”, the side is retired and the teams then switch batting and fielding. This a very rewarding experience for all who participate. Emphasis is placed on having fun, participating at whatever physical level is achievable, meeting new friends, being outdoors, etc. Patience on the part of volunteer “Buddies” is guaranteed. Games conclude with a food and beverage snack sponsored by parents each week on a rotating basis. We recruit "Buddies" - student volunteers from middle school and high school to help the players. Knowledge of baseball is not necessary. Buddies help facilitate the player's involvement in the game by helping with catching a fly ball or fielding a "grounder", assisting with a throw, keeping the player engaged on the field, assisting the player with batting skills, etc. Some players with wheel chairs need to be pushed around the bases, while other players need direction and assistance with base running. We try to match players to Buddies based on gender, size and age. As Buddies often cannot make every game, they are not always assigned to the same player although this is the ideal situation. Buddies are generally contacted in February in preparation for the upcoming season. Play is open to Lower Merion & Narberth residents. There is no registration fee for Challenger Division and personalized Game Shirts and Hats are provided at no charge. Feel free to join us for a game or two if you are not sure this will work out for the longer term. We are happy to have any interested players participate in the hope they enjoy the experience and want to continue although there is no obligation to do so. Registration is required for players and buddies prior to being allowed to play or volunteer. The 2019 season will begin with our indoor 'Spring Training' Games on Sundays March 24th and 31st and our first outdoor game at South Ardmore Park Field B on Sunday April 7th! Please complete your registration now at www.lmll.org. You will be contacted with game day details as we draw closer to early March.